The privilege of a garden is not for everyone. Or is it? IKEA has created an indoor garden, easy on the eye and simple to maintain, all year around. The VÂXER series is built on hydroponics, a word simply translated as growing plants in water without soil. With added nutrients and the right light, hydroponics allows you to grow a garden in small spaces, even in the winter. The increased migration to the cities results in the fact that people are moving further and further away from where food is produced. At the same time people are more concerned with living a healthier and more sustainable life at home. With the option to chose between 18 different seeds the green series is a big step in letting people take charge of their own food production. 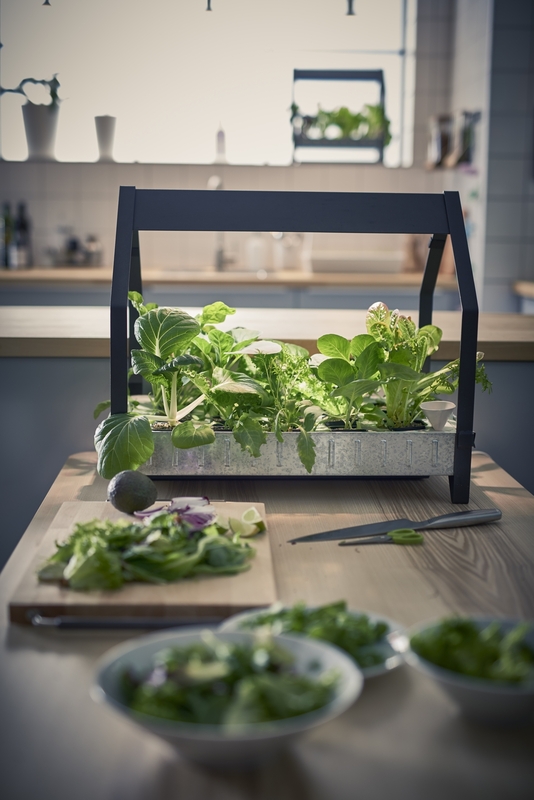 The development of an easy and affordable hydroponic system was a collaborative process between agricultural scientists in Sweden and one passionate product developer at IKEA. "This is part of the mega trend of urbanization: people living without the possibility to grow their own food. We are very interested in, not only that they grow, but also the taste—they should taste good, very good actually," says Helena Karlén, lecturer at the Swedish university of agricultural sciences, in a press release. The series is compact and very space efficient, and is given a simple and sleek design. Associate professor at the Swedish University of Agriculture Sience, Håkan Asp, thinks the future of hydroponics is bright, since you can almost grow anything with it. Hydroponic growing can also be educational for both young and old, and an important aspect of future of food production.